← Having a learning difference is like being gay. Or left-handed. Maybe it’s the season, but festivals are in the air. Whether you prefer funfairs, music, or hot rod and muscle car shows; wine, beer or BBQ championships; artichoke, garlic, or chocolate and chalk art celebrations, there’s something happening every weekend. And that list represents just a portion of this month’s festivals. Last weekend, the children and I went to the Bay Area Book Festival in Berkeley. This was a celebration of literature in all its forms. There were talks by Big Names, stalls with new book releases, and book-signings. Berkeley was buzzing with the literary literati. 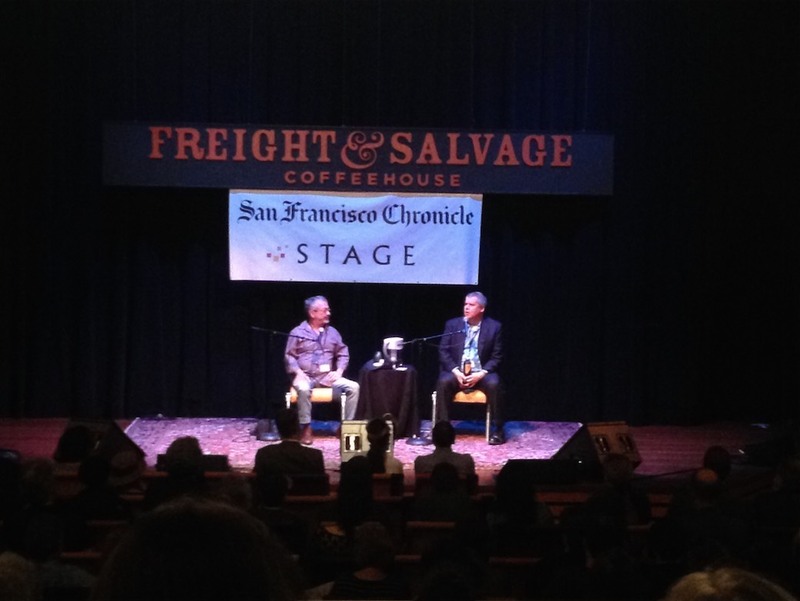 Authors took to the stage in various locations around downtown Berkeley. We arrived on Sunday in time to hear a conversation between Daniel Handler (the author – under the pen name of Lemony Snicket – of A Series of Unfortunate Events) and Rabih Alammedine (whose most recent novel is An Unnecessary Woman). They were a witty, funny duo, and they shared some surprising outlooks on their creativity. Rabih asked Daniel if he ever worried that his writing wouldn’t be good enough. Daniel replied that there was no point worrying about that, because of course his writing was never going to be good enough. He said that’s like asking, if you jump out of a window, are you worried you’ll hit the ground? Of course, you’ll hit the ground. The variable isn’t whether or not you’ll hit the ground, but whether or not you can cope with the pain. And that applies to all creative endeavours. 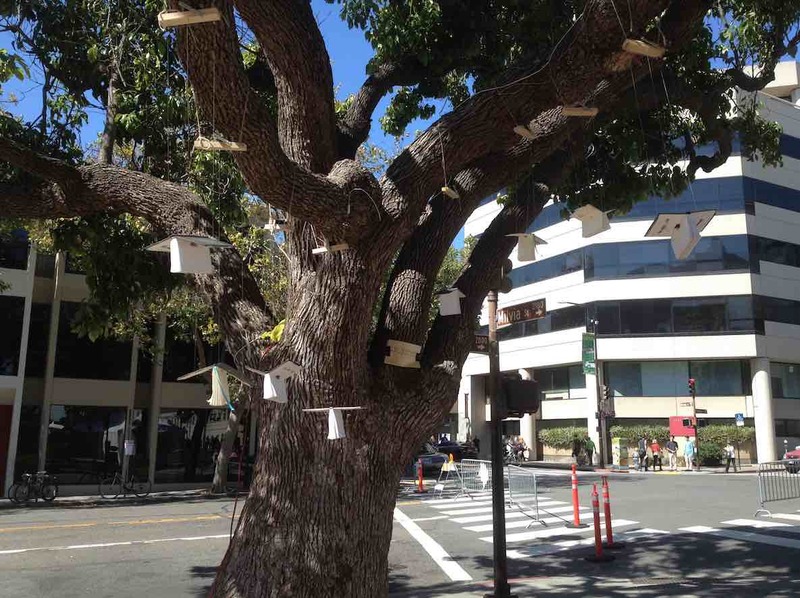 A motorised flapping book tree. Obviously. The surprise from Rabih was his confession that after he was given the Guggenheim Fellowship (an award for exceptional creative ability in the arts), he fell into a deep depression for two years. He explained that he saw his role as the need to prove people wrong and challenge their thinking. Winning the prize meant that he was too well accepted and no longer had a role. I guess that was one of those “be careful what you wish for” times in his life. All 50,000 books in the lacuna were available for visitors to take away, leaving ever-increasing gaps in the shelves. By the end of the festival, virtually all of them had gone. That may have been because they were free, but I suspect the visitors to the book festival were there because they love books. And even in the Bay Area, on the doorstep of Silicon Valley, the home of the computer, people still love printed books. I can’t wait until next weekend’s festivals. One of the options is a rodeo in Livermore.